TL;DR – So are you Team Rui En or Not? Since Rui En was reported to have totalled a motorbike with her BMW, and to have reeked of alcohol, everyone’s been either team Rui En or team Rui-En-is-a-drunk-a**hole. On top of an interview with the poor owner of the motorbike, the president of Rui En’s fan club penned a letter seemingly providing excuses for her behaviour, her agency has also released a statement, while disgruntled Singaporeans grumble in Facebook comments on how she’s snooty and proud. It struck me as strange that any Singaporean should feel compelled to cast judgement on a situation that no one has facts on, other than the ‘so-called facts’ and speculative stuff provided by media outlets that are dedicated to rile emotions. I’m not accusing local media outlets of anything, but creating emotional content is part of every basic online content 101 you’ll come across. 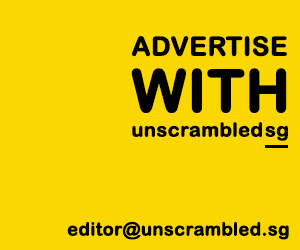 As this website is called Unscrambled, as in we decipher local content for you to understand in a clearer context, here’s Rui En’s incident unscrambled. Not the accident, mind you, but the effect that Rui En’s accident had on the internet mob in Singapore, and all the aspects of it that triggered an emotional reaction. First off, Rui En is a public figure. As a person who places herself in the public eye, it’s a given that she would be placed under public scrutiny. This means that she is held as a role model and has standards to uphold. Being caught destroying someone else’s property, and allegedly smelling of alcohol while behind the wheel — not quite role model material. On top of that, Rui En drives a BMW. The price tag wouldn’t usually matter, except that it creates a David and Goliath effect that didn’t exist when she was just another actress scowling on the Star Awards stage. For those unfamiliar with this term, it refers to a popular Christian story about a small human, David, facing off a giant, Goliath. Here, Rui En is being cast in the role of the Goliath — the big rich star versus average Singaporean. BMW versus motorcycle. BMW crushes motorcycle, and in a strange metaphorical sense, people are imagining Rui En crushing the poor motorcyclist, even before the facts are laid out carefully. And when she says something like “Do you know who I am?”, it blew the entire situation out of proportion. Talk about a PR fail. Know what? We actually believe her. The accident had happened right where she lives, and it’s perfectly plausible and logical that someone would say something like that. Unfortunately for Rui En, the first reports had run with “Do you know who I am?” and most people don’t read the clarification reports later, sadly. The thing about being the Goliath in a David and Goliath effect is that everyone wants you to fail. It’s the punchline in every movie, and the way we’ve been taught that justice and peace can be maintained in this world. Tiny man in suit takes on giant monster taking over the city. Small child with big dreams defeated larger bully with wit and skills. Small, scrawny boy wins the girl instead of the buff sporty jock. And in the story between the drunk superstar with the BMW and the motorcyclist, the ending was written before the facts were written out. Singapore’s not unfamiliar with the David vs Goliath story. Small, resource-less, and young country faces off with bigger, stronger nations. It’s the very commentary of our history, and us as Singaporeans have embodied this National Education story to our core. We feel frustrations when other countries try to bully us, we cheer when we hear about how LKY fended off the CIA with wit and cunning. We feel pride because we are all from the kampong fighting off the city folks. [textmarker color=”#000000″]But in 2016, in the year that Singapore turns 51, we no longer have to hold on to that David and Goliath story. We’re not strong because we are small, we are strong because we are smart and adaptable. And nothing makes us smarter than looking at the facts, and making logical conclusions before pointing the finger and criticising. So what can Rui En do? Nothing — except admit defeat. But, instead of waiting for the Davids of the world to hurl rocks, the best a public figure can do in this situation is to hang her head, apologise, and wait for the next Goliath to show up. Which shouldn’t be long. This is an excellant analysis. And she did well by making a public apology during her acceptance speech for her award.